Everyone seems to have a different way of poaching pears using completely different ingredients. I've tried a number of recipes some that use wine and some that don't, and this is my favourite. The poaching liquid can be made with or without wine, depending on what what happen to have on hand. I've done it both ways and have been equally happy with the taste. Pears are one of my favourite fruits for cooking, I love the texture they get after they've been cooked and how the simply ooze taste. The great thing about poached pears is that it's incredibly simply to vary the flavours based upon your preferences. These pears taste distinctly of vanilla, cardamom, and lemon - all good things in my books. The original recipe is served with labneh and pistachios. I decided to serve them pain d'epice, making for a warming and spicy combination. 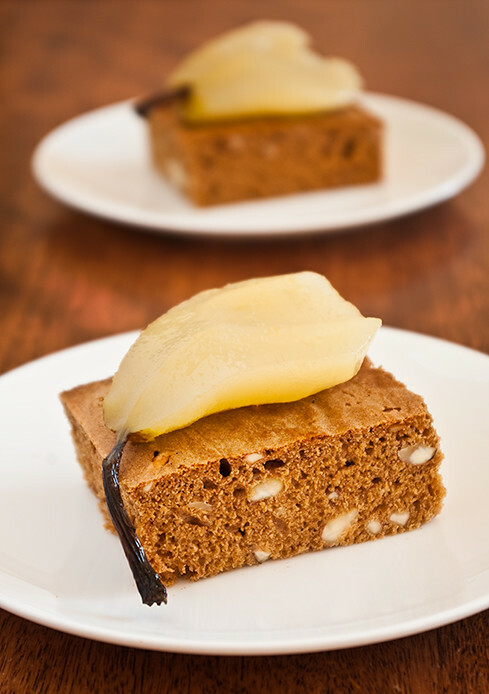 The poached pear recipe comes from Decadence: Desserts by Philip Johnson, which is one of my favourite books. I've made at least half the recipes over a number of years and I've only had one failure which was entirely my fault and still tasted amazing. The book itself isn't very large but the recipes are so good it just doesn't matter. And now for the Pain d'Epice. traditionally contains rye flour, however I didn't have any in the cupboard so I had to resort to to using wholemeal flour. Texture-wise the top of this is kind of chewy and a little odd. I sliced off the top crust of mine as I didn't like it - the insides are quite tasty though. The aging it for a day or two helps to soften it up but, personally, I would prefer it it were softer from the beginning. I greased and lined my tin but if I were to make this again I would omit the lining. The texture of the crust is much nicer in the parts that were directly in contact with the sides of the tin. I'm sure someone wiser than me knows why this is the case but until they tell me, I can't explain it! Combine the sugar, water, and wine in a medium sized saucepan over a medium heat and stir until the sugar has dissolved. Add the cardamom, cinnamon stick, star anise, lemon zest, vanilla bean, and vanilla seeds. bring to the boil, then reduce heat and simmer for 5 minutes. Meanwhile, peel, halve, and core the pears leaving the stems intact. Reduce the heat to low, add the pears, then cover with baking paper and a plate to keep the pears completely submerged. Poach gently for 12-15 minutes, or until tender. Using a slotted spoon, transfer the pears to a bowl, then pout half the poaching liquid over them. Set aside to cool. Strain the remaining poaching liquid through a fine sieve and return to a saucepan over a medium heat. Discard the aromatics. Bring the poaching liquid tot he boil, then reduce the heat and simmer until reduced by one-third. Set aside until required. makes one 23cm (9-inch) loaf. Preheat oven to 200°C (400°F), grease a 23cm (9-inch) loaf pan. In a large bowl, combine the 1/2 the wholemeal flour and 3/4 of the plain flour, whisking to combine. Measure honey into a large jug and pour the hot water over, stirring well to combine. Stir in the sugar, salt, baking soda, and baking powder. Add the cognac, then all the spices and the orange peel. Make a well in the center of the combined flours, and gradually whisk in the honey mixture, taking care that no lumps form. Whisk in the remaining flours, combine until the batter is just smooth. At this point, according to the recipe, the batter can be covered and set aside in a cool place for up to 5 days to age. Just before baking, add the shopped almonds and stir until completely mixed. Scrape the batter into the prepared loaf pan. Bake in preheated oven at 200°C (400°C) for 10 minutes, then reduce the heat to 180°C (350°F) and continue to bake for 50 minutes or until well done an a skewer cones out clean. Once cooked, remove the loaf from the pan and cool on a wire rack. brush loaves with warmed honey. Once cool, wrap the Pain d'Epice in plastic and age for 1-2 days before serving. Pears are in season here and they taste wonderful and do not cost a fortune - what a delicious combo of flavors you have here, it makes me think of fall! Patricia: Thank you, this is definitely my favourite recipe for poached pears! It definitely does have an autumn flavour about it!